It is really awesome seeing what an extensive comparison has been made between the graphical performance of HTML5 and Adobe Flash when running on a variety of mobile devices. Software architect Sean Christmann took his time and set up a number of benchmarks testing how well each platform performed in different scenarios ranging from vector and bitmap rendering to HD video playback. Nine different smartphones and tablets were used for the test, all of them running the latest official version of their respective operating system. Even though HTML5 has been quoted by some as a potential Flash replacement, the end results were mostly in favor of Adobe's platform. Could it be because Adobe itself partially funded the research? Well, this doesn't seem very likely because identical source codes were being used for every type of test. 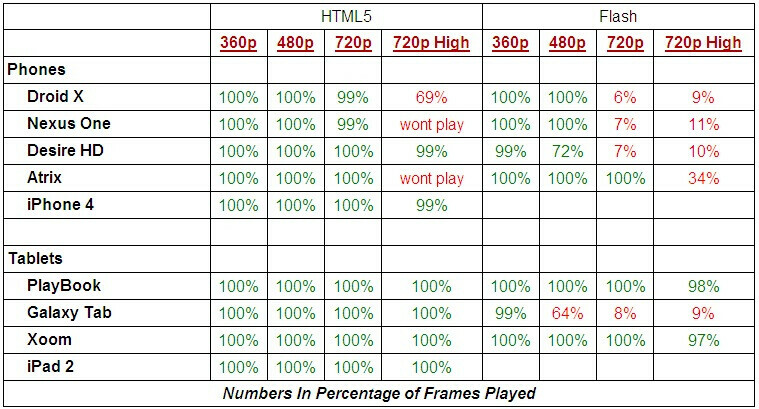 When all the testing was done, it turned out that Adobe Flash had no troubles rendering simple and complex 2D graphics at high framerates, yet HTML5 was a clear winner when it came down to playing HD videos in H.264 format. Most devices were dropping a considerable amount of frames when rendering them with Flash, while using HTML5 for playback gave much better results. Just to be sure that all data was correct, Christmann decided to go for overkill and actually counted every frame rendered with a high speed camera. So, it looks like Adobe Flash is not anywhere near becoming obsolete, but there is still a lot to be desired in terms of video rendering performance. Hopefully, future software updates will be able to do something about it. If you notice Flash did bad on single-core devices. With dual-core devices Flash did well & for the most part it's only going to get better because quad-cores are JUST around the corner. HTML5 is a clear winner in the single-core area, but with multiple-cores becoming the norm the differences will be minimal to non at best. Flash is not going anywhere, HTML5 is the future like by 2019 or so, unless Flash makes some changes. Flash's HUGE install base makes them too formidable & I am sure Adobe is working to make Flash even more efficient. 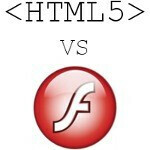 So Flash & HTML5 look to be sharing the spotlight for a VERY long time! Did you see Apple's results with Flash, ohh yeah Apple doesn't run Flash! So in the mean time Apple users won't be able to enjoy the internet as much because of Flash’s dominance in the World Wide Web! couldn't agree more. html5 standards won't even be set for a long time. too see just how far behind html5 is just look at IE9--the new modern MS browser. . . It doesn't matter what html5 can do if the browsers don't support it and that's why no one should be using a browser supported/owned by MS & apple--they don't want to see the web truly succeed. back the browsers that are pushing the web forward, supporting standards, and open-source so the web remains THE open platform it was designed to be. In an unbiased answer, could someone reply with what I'm missing by not having flash on my phone? And please don't say "games," I have 100 games from the app store installed. I can only think of a fancy animation that is supposed to play on my bank's website. I can't really say that I'm upset I don't have flash capability, but I'm possibly just ignorant to its "killer app" features. Anyone? This is one example of many, I can't load up a MLB.com site for a certain baseball team. Without Flash it limits my viewing pleasure. I am relegated to pure text. I can't see the LIVE Gameday function of the website, I can't see the up to the moment stats, video clips of run scoring plays, homeruns, stolen base, great defensive plays and so on. With Flash the diving play that I was reading about in text form is actually illustrated to me in real live gameday video which adds to the dynamic of the text. THAT is what is missing from a Flash less device. I can go on & on but my post would almost be infinite. The World Wide Web is so full of Flash content that there is not enough room to even state them all! Imagine Flash game sites, the user created original Flash content community, so on & so forth. I hope this helps to understand why Flash DOES make a difference. Some people will say “well I don’t need that”. Then essentially you are just reading a newspaper. You are missing so much of the wonder the World Wide Web has to offer through Flash! Another site is radiotime.com. Its a music streaming site for live radio, probably the best site for live radio. The phone app JUST got updated to where you dont need to visit the site on your device anymore. But, Flash was my best friend most of last year. I dontr know if it cant run on iDevices. I asked some folks on Engadget and never got a response...lol. But I know for Android phones it needed full Flash to work, not Skyfire. Exactly we are talking about the pleasure side of Flash on phones. There are even more business & school reasons why Flash is so important. People like myself for instance, needed a laptop to do certain tasks for work but now that my phone or tablet runs Flash that is one less thing I need to carry. Without getting into too much detail of what I do, I can access client information through our company's Flash website almost instantly with my phone. I would have to turn on my laptop let it load & then access it. So Flash essentially save me time also. In the business that I am in time is money. Again there are just too many reasons why Flash is important. This is something that is very common thinking, every MAJOR mobile company HTC, Samsung, Motorola, Nokia, RIM, LG, Sony, Pantech, ZTE, & the list goes on, has or will have Flash. The only one that doesn’t is Apple. It depends on what you use your device for. I bought my Motorola XOOM strictly to do scheduling and to access my patient files... the website we use for that relies heavily on flash, and I would still be forced to do this on my laptop if my Thunderbolt and XOOM could not run flash. I also read quite a bit of news articles on my tablet/phone, so being able to play the embedded flash videos is much easier than having to load it via my youtube app. Like I said, it all depends on what you use your devices for, but what it boils down to is that any device with flash is more capable than a device without. At least if you are trying to remove the need for a regular computer. Yea my girlfriend found out about Flash trying to do online classes for school. It worked great on my Droid X. With my phone she could do school work on her job during breaks. Its not always about fun n games with needing and wanting Flash. I keep saying....once HTML5 becomes the standard, norm then fine. Until then....I will use Flash while its available. Again, I'm surprised that fagroids haven't heard of Skyfire browser that allows the ipad and the iphone to view flash contents of a website. Also, they admit that html5 is the future, but it seems like they want to hold on to flash for as long as they can. Why? Because of their pride, and the thought that flash is something that android devices offer natively while idevices don't (unless you download skyfire) It's amazing how fanboys will delay the very obvious coming of html5 just because of their silly pride. Tsk, tsk, tsk. Edit.....dont wanna waste my time or energy even replying. gemini? You feeling inferior with your shinny little glass phone? Or are you just pissed because you are starting to realize you made the wrong choice of OS. I'm sure if you keep that phone another 5 years, you will see just how much better HTML5 really is. Just hang in there little girl! No one bashed your OS, you started this BS and I'm sure its because you have a real inferiority complex about how little your phone does and how much money you have to shell out to make it do anything. It's not Googles fault that Steve Jobs didn't want you to have flash on his phone. Get a different phone next time and STFU! Don't attack Android users for having features you will never enjoy. Just say what's on your little under developed mind, and keep it movin! Because your little girly attacks are annoying as hell! Didnt you get the memo? Choice is a bad thing....unless that choice is related to the iPhone.